The new Lindau Science Trail serves as a permanent embodiment of the Lindau Nobel Laureate Meetings, their history and first and foremost makes “Nobel knowledge” accessible to everyone. The Lindau Science Trail can be followed not only by those living in and around the picturesque city of Lindau; visitors from all over the world can go on their very own journey of discovery. On knowledge pylons that are spread out all around Lindau, one can learn more about the everyday applications of scientific phenomena. And who knows, there might just be a Nobel Laureate waiting around the corner – in Lindau you surely can’t rule it out. Knowledge should be freely available to everyone at all times. This credo is at the heart of the philosophy of the Foundation and the Council for the Lindau Nobel Laureate Meetings. For more than 65 years, Nobel Laureates and young scientists from all over the world have come together in Lindau once a year to exchange ideas and learn from each other. 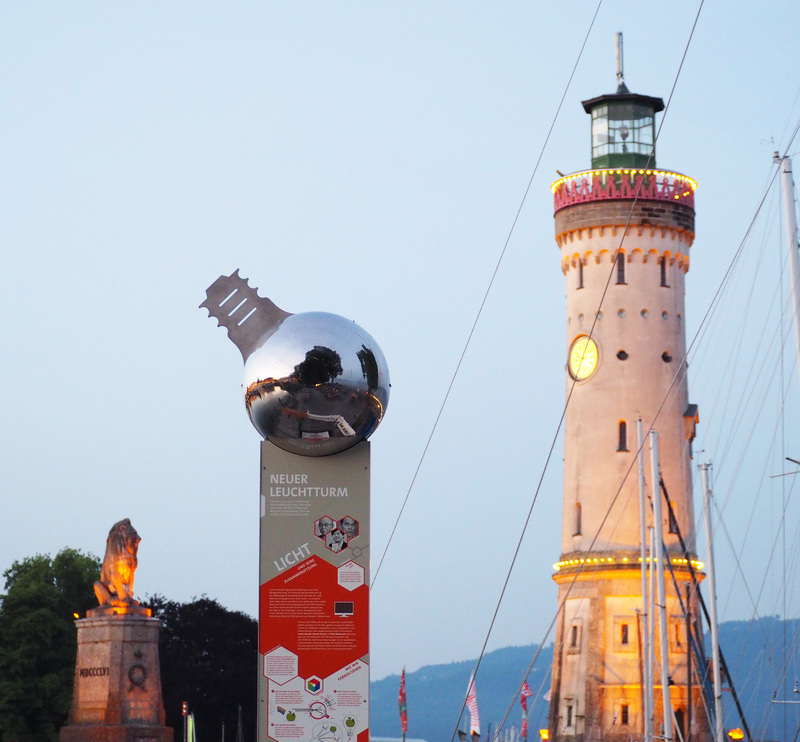 The “Lindau Spirit”, which inspires the participants year after year, can now be experienced on the Lindau Science Trail by everyone throughout the entire year. 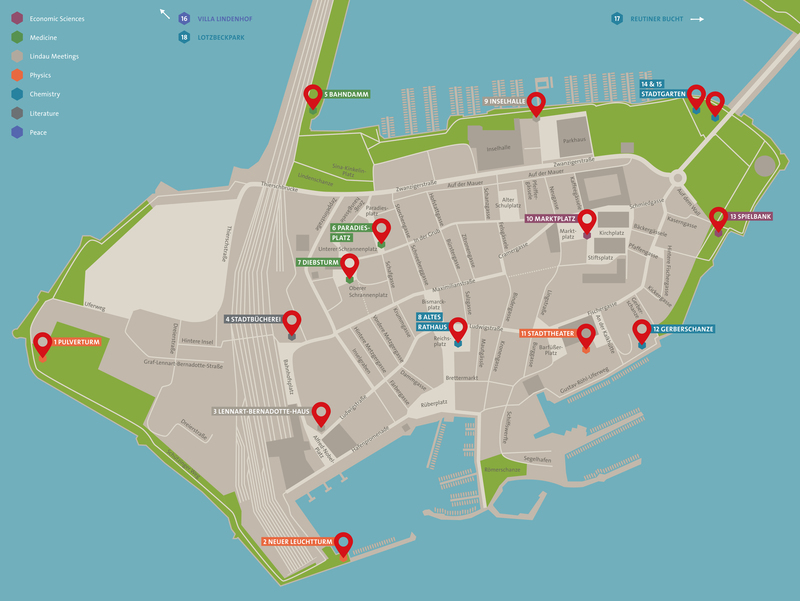 The Lindau Science Trail consists of a total of 21 knowledge pylons, 15 of which can be discovered on the island of Lindau. On the mainland of Lindau and on Mainau Island there are three pylons each waiting to be explored. At the knowledge pylons, explorers big and small can learn more about various scientific discoveries and about the different Nobel Prize disciplines in English as well as in German. The pylons cover the three natural science disciplines – Physics, Chemistry and Physiology/ Medicine – as well as Peace and Literature. Two knowledge pylons explain economic theories in a manner which is easily understandable; two others provide insight into how the Lindau Nobel Laureate Meetings started and tell the story behind the Nobel Prizes. You don’t have to be a science expert to understand the explanations on the pylons. 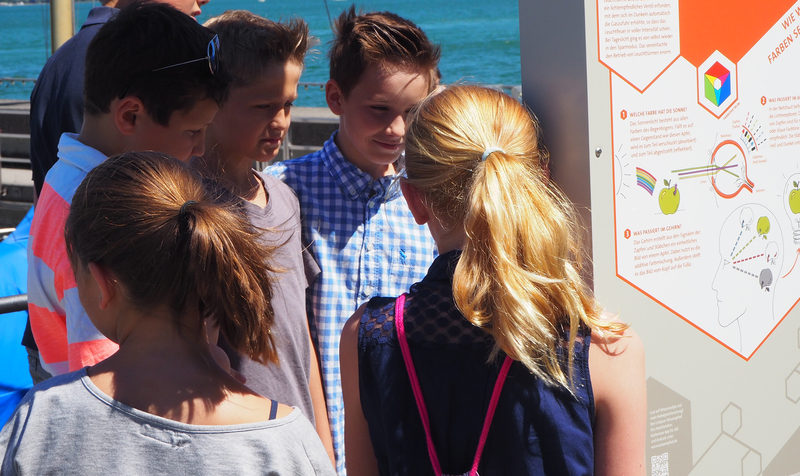 The Lindau Science trail addresses grown-ups as well as children. There is a special children’s section on every pylon. Spotlight on the “Lindau” Nobel Laureates: The Nobel Laureates that have visited the Lindau Meetings thus far will be honoured at one central spot: on the “kleiner See” that separates mainland Lindau from Lindau island there will soon be a pier where the names of all the Nobel Laureates who have already visited the Lindau Nobel Laureate Meetings will be listed – more than 450 laureates. A dedicated app will allow you to meet the Nobel Laureates virtually on the Science Trail. At six different locations, virtual Nobel Laureates explain why they have received the Nobel Prize. You can even take a selfie with them! The app also gives you the opportunity to test your freshly acquired ‘Nobel Knowledge’. While ‘hiking’ on the Science Trail you can try to answer the numerous quiz questions. The Rallye can only be taken right on the spot, not at locations remote from the Lindau Science Trail – an open invitation for all science enthusiasts to come and visit Lindau and take the chance to meet Nobel Laureates. Those who cannot physically come to Lindau can still discover the town, the Nobel Laureates and their research by virtually walking along the Science Trail and visiting the pylons in the app. Teachers can use it in the classroom as well. If the Science Trail is also available virtually what’s the point in taking a field trip to Lindau and experiencing it first-hand? In addition to jointly completing the Science Trail and the Rallye, a surprise is waiting for all students here in Lindau. Teachers, who are interested in a school field trip to Lindau, may contact the Council for the Lindau Nobel Laureate Meetings for more information and additional material. The realisation of the Lindau Science Trail was enabled by the support of the city of Lindau and the Prof. Otto Beisheim Stiftung.